LET'S BE INVOLVED IN THE POLITICAL PROCESS AND WORK TOGETHER TO STOP AGENDA 21 - BELOW ARE SOME GENERAL GUIDELINES. FOR IMPORTANT MEETINGS & COMING EVENTS GO TO OUR EVENTS PAGE. ELECTIONS: Vet, Support, Vote. ﻿Municipal Elections will be in November 2015. A) Vet candidates to find out which one﻿﻿s support want to defend property rights, maintain local control, etc. As objectively as possible, ask tough questions. Your goal is to elicit honest answers -- not politicians' answers. You want to find out what a candidate really believes and what he would like to do once in office. B) Support good candidates in their campaigns. Often those who want LESS government, have FEWER resources. As circumstances allow give time and money when possible. C) Remember to vote and also encourage others to go to the polls. Learn more about Agenda 21. Go to our HOME page and check out the websites and video resources. To get an idea of the kinds of issues that may require our involvement go to our NEWS page. Add key words and definitions to your vocabulary so you can recognize issues that might relate to sustainability. E.g. Livability, complete streets, smart growth, green space, EPA, HUD, DOT, walkable. Find out about the current issues. Newspapers, radio programs, and television broadcasts often give a biased view, but you can often learn about some of the current issues. For example, in Utah County Restore America on KSRR radio 1400 am on Friday mornings at 10 o'clock focuses on the proper role of government and local issues, particularly those in Orem City. Start asking questions about legislation and planning. Is this issue genuinely urgent? Is the information accurate? Are we told there was a “consensus?” Is this the best solution? Is this a boiler plate solution that has been brought into our community from elsewhere? Does it reflect our needs and values? Does this proposal respect our property rights? Does it expand the reach of government? Is it consistent with principles of free enterprise? Who stands to profit financially? What will it cost me and my fellow citizens? Will the next generation pay? Can our city/co. afford it? Is it worth the price? Will the people be able to vote on it? Find out the names of your Utah State Senator and Representative so you can contact them on important issues. Go the the Utah State website by clicking HERE and enter your address. Get to know them. Check their voting records. What have bills have they sponsored or cosponsored? Many organizations score legislators by how they vote. HERE (in a new window) is a link to a combination of score cards for the 2013 legislative session. Sign up to receive our emails. Fill out the form on our CONTACT page. Please include your city and county since we will be extending our efforts throughout the state. Your phone number and the district numbers and names of your state senator and state representative can also be helpful. If you do not hear from us, check your junk mail. Know that to protect your privacy; it is our policy to blind copy email addresses when we send out notifications, and we will not sell your information to others. Find out which region of the state your county is in. 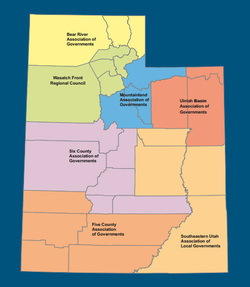 There are seven Associations of Governments (AOG) regions in Utah:  Bear River Association of Governments  Wasatch Front Regional Council  Mountainland Association of Governments  Uintah Basin Association of Governments  Southeastern Utah Association of Local Governments  Six County Association of Governments  Five County Association of Governments. Check the map at the top of this page and then go to your region's website to learn about your region. Find out when meetings are held. Go to your school board, city, county, or region website OR go to Utah’s Public Meeting Notice website HERE. Select the type of government, then choose the entity and public body from the lists that appear. Scroll down the page to the meetings. For other, non government, public meetings on the public meeting notice site, click on the advanced search button in the upper right hand corner of the page. For example, if I wanted to know about the meeting for my county’s regional meeting, I would go to the public meeting notice page, click on advanced search and type in Mountainland. To get more meeting information, including agendas and minutes of previous meetings, go to the website for that organization. Begin attending local city, county and regional meetings as time and circumstances allow. Get to know your city council members and planners as well as your county planners and commissioners and others. Taking a friend along can help give confidence and provide someone to help ask questions and verify answers. You will discover that most of these elected officials are good people who really want to do the right thing, even though many are unaware of the ramifications of their decisions and the ultimate goals of sustainability. Contact your state and U S senators and representatives. oin our meetup group for meeting information and reminders. Go to this JBS page HERE and on the left side choose federal or state action alerts. If you create an account, you can send automatically generated messages to YOUR elected officials. To learn about various issues, read the message that has been prepared for them. Edit the message if you wish and click send. It only takes a minute or two to make a difference! Let your voice be heard. Share what you know with others and help them get involved.